Thanks to the innovative steerable cylindrical scrub deck, the BR 35/12 C Bp can clean adjacent to the wall at a 90 degree angle. 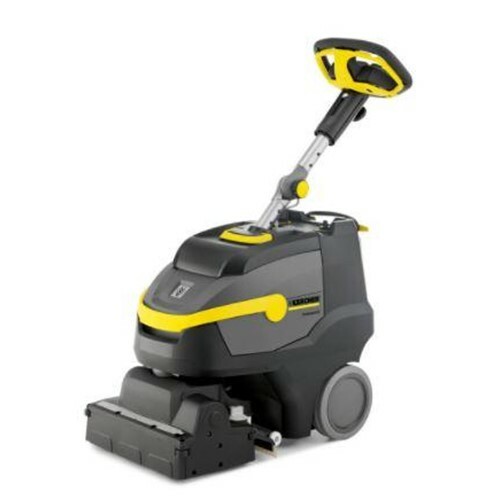 It can scrub in any direction making it the most practical scrubber for tight and congested areas. The steerable cylindrical scrub deck is an outstanding technical innovation: It can be horizontally rotated 200 degrees in both directions, finally eliminating blind spots when cleaning! The height-adjustable, telescoping and folding steering column allows any operator to set it to their most ergonomic working position. The folding steering column and eyelet tie-down points also makes it easy to secure for transport.